Pop culture has consistently proven to be a hot topic in social media, and last week the announcement that two famous singers would be joining the judges’ panel on The X Factor reality show made the ranks of top stories on both Twitter and blogs. The two judges who shared the social media spotlight—pop star Britney Spears and teen singer/actress Demi Lovato—disseminated that news through their Twitter feeds. For the week of May 14-18, the X Factor was the No. 1 subject on Twitter and the No. 5 story on blogs, according to the New Media Index from the Pew Research Center’s Project for Excellence in Journalism. But there was a difference in some reactions on the two social networks. While Twitter users were overwhelmingly supportive of the stars joining the show, the blog response was somewhat more critical. The X Factor, which is a singing competition, is a British import that has aired on the Fox Network since September 2011. In recent years, musical talent shows have become a staple of reality programming, starting with the decade-old American Idol (also a Fox program) and more recently, NBC’s The Voice, which premiered in April 2011, and ABC’s Duets, which premiered on May 24 of this year. While these shows focus on the competition, the celebrity judges are the real stars of the shows. Pop culture and its stars are frequently among the leading weekly subjects on Twitter, where news about boy bands, Justin Bieber and Miley Cyrus is often tweeted. Aside from the X Factor news, a Tweet from Lady Gaga was the No. 2 story on Twitter last week. Celebrities are less likely to show up among the top weekly subjects on blogs, but one exception is the blogosphere’s tendency to celebrate the careers of entertainment stars who have just passed on. And last week, the death of Queen of Disco Donna Summer was the No. 3 story on blogs. The X Factor conversation in social media last week helped highlight the different functions of the two platforms. Blogs tend to be longer-form, more debate-focused forums, and in this case, bloggers offered a range of reactions and critiques. On Twitter, a platform primarily for sharing news and instant response, the reaction was more enthusiastic and overwhelmingly positive. “So did Britney bite off more than she can chew here? We all remember her wild, head-shaving, umbrella-swinging days of a few years back. But lately, Britney’s been living surprisingly under the radar, just quietly cranking out slinky disco-pop tunes and taking care of her kids,” wrote Dave Nemetz at Yahoo’s TV page. Other bloggers were more supportive of the new judges. “I didn’t watch one episode of X Factor last season, but if Britney Spears AND Demi Lovato will be sitting at the judging table in season 2 of the FOX show I doubt I’ll miss one minute of it!” wrote Jewel Wicker for The Jewel Wicker Show. Most twitter users voiced pleasure with the judge selection and their excitement over the new season, and some addressed their tweets directly to Demi Lovato. “Good luck with X Factor gorgeous, just what you need. People need to see more of your adorable personality, you’ll be amazing! @ddlovato” wrote Paulie. “So Proud! Look who is the new Judge on X Factor! @ddlovato” wrote Shari Short. “So excited for Britney on the X Factor!!! !” tweeted Brad Goreski, a stylist who stars in his own Bravo reality show, It’s a Brad, Brad World. “Now that Britney and Demi are gonna be judges on The X Factor, I am totally watching the show from now on,” wrote Megan Behnke. At least one Twitter user was more analytical in his opinion of the show’s judge selections. “X Factor needs Britney. Demi needs X Factor. There is a difference,” tweeted @AMENHOOKER. As is typically the case for celebrity deaths, the blogosphere obituaries for Donna Summer were full of pleasant nostalgia and memories. Several online publications, including EW and People, even shared playlists of her music. “When people think of mindless disco, what Donna Summer sang wasn’t it. She had a terrific set of pipes that could have succeeded in any genre; she happened to flourish in dance and pop music,” wrote Pam Spaulding at Pam’s House Blend. “R.I.P. Donna Summer, Queen of Disco, and the only other person who could do justice to that wonderful musical mess known as MacArthur Park,” wrote Joey deVilla on his blog. One blogger even wrote a limerick for the departed singer. And her beautiful voice. What a bummer! Who’s Last Danced to her own disco drummer,” wrote Madeleine Begun Kane on her blog, Mad Kane’s Humor Blog. The top story in blogs for the week was a series of rumors about a new MacBook Pro and iMac. The rumors were mostly technical and bloggers warned their readers to be wary of them. The buzz was about a new, thinner MacBook Pro that would have a better Retina Display and a faster USB connection. Both the new MacBook Pro and iMac are rumored to have a new processor, the Intel Ivy Bridge Core. Meanwhile, the No. 2 story on blogs was Twitter, which announced it would be sending a weekly email digest summarizing the most relevant tweets and stories shared by people you’re connected to on Twitter. It also implemented a no-tracking privacy option and offered more tailored suggestions of who to follow on Twitter. Tech bloggers were generally pleased with the changes and many compared Twitter’s moves to Facebook. “While privacy seems like a concept lost on Facebook, Twitter is showing that it understands its users’ need for security by supporting Mozilla Firefox’s ‘Do Not Track’ feature, a day before Facebook is set to raise billions in its IPO,” wrote Devindra Hardawar at Venture Beat. “[T]his is the social network’s first big move that shows it following in the footsteps of Facebook, as the more personal info they collect on your interests and activity on their platform, the more info there is to feed targeted advertising and tweets,” wrote Rip Empson at Tech Crunch. 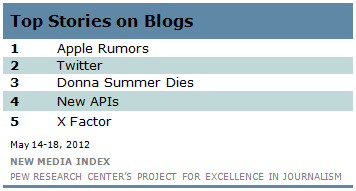 The fourth-biggest story on blogs was also tech-related, a discussion of new web applications to build software. Programmable Web’s directory of Application Programming Interfaces grew by 71 APIs. The No. 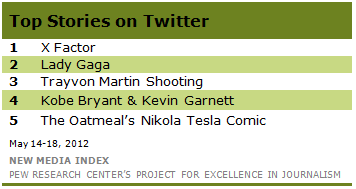 3 story on Twitter l ast week was news about the Trayvon Martin shooting. The Sanford, Fla. police released a report March 13 saying that the encounter between George Zimmerman and Trayvon Martin was “ultimately avoidable by Zimmerman.” Most Twitter users who opined on the article agreed with the report that the shooting was avoidable. In fourth place was an article focusing on NBA superstars Kobe Bryant and Kevin Garnett in two of Wednesday’s NBA playoff games. Bryant and the Lakers lost to the Oklahoma City Thunder 77-75 as Bryant missed a potential game-winning shot in the final seconds. That was just hours after the Boston Celtics’ Garnett wrapped up a dominant performance with 27 points and 13 rebounds to beat the Philadelphia 76ers 107-91. And the No. 5 topic was an ode to a famous inventor by The Oatmeal, a popular web writer and illustrator. Written as a comic, Why Nikola Tesla Was the Greatest Geek Who Ever Lived, The Oatmeal defends Tesla and is critical of Thomas Edison. Tesla (1856-1943), a Serbian who later became an American citizen, invented several devices including the magnifying transmitter, the alternating current motor and the Tesla coil. Despite all of his inventions, he died almost penniless and as a recluse. The Oatmeal argues in his comic that Thomas Edison took credit for many of Tesla’s inventions. The Tesla piece got significant pick-up on Twitter, where tweeters displayed a real devotion for the inventor. “The @Oatmeal knocked it clean out of the park with this one about Nikola Tesla,” wrote @seanparsons. “This great Oatmeal comic describes some of the reasons why Nikola Tesla is one of my favorite people in all of history,” wrote Shay Pierce. “The Oatmeal outdoes itself with this Nikola Tesla feature. Just. Epic,” wrote Andy Croll. For the second week in a row, the 2012 Mexican presidential election drew the most attention on YouTube, with a clip featuring Mexican presidential frontrunner Enrique Peña Nieto registering as the most-watched news video. In the video, Industrial Revolutionary Party (PRI) candidate Nieto is being heckled and eventually chased out of the university by students during a visit to Mexico City’s Universidad Iberoamericana on May 11. Students blamed him for a violent crackdown on protesters in the town of Atenco in 2006. Following the protest, some PRI members accused the hecklers of not being students at all, further angering Iberoamericana students who launched a YouTube video called “131 Ibero Students Respond” in which they were seen holding up their student IDs. Nieto still holds a big lead in the polls ahead of the July 1 election.